While writing about the origins of the Dead Sea and Jordan Valley I was confronted once again with one of the most striking pieces of evidence for an ancient earth that I am aware of. Take a look at the figure below. This figure shows the smoking gun. Smoking gun evidence of what? That the earth’s plates have been moving slowly for millions of years. It is smoking gun proof* that the earth is very, very old. Radiometric (Geological) estimates versus Geodetic/GPS estimates of continental plate motions. Figure from AlReheji et al. 2010. The dashed line represents perfect agreement of plant motion estimates made by two independent methods. This figure should cause young-earth creationists—diluvialists or Flood geologists—to lose sleep at night, wondering why God provided evidence that contradicts a young earth. Some will grasp for an escape chute and claim that these data are the result of God’s creating the world recently but with the appearance of age while others will cast doubts on the validity of data or the scientists who collected them but at the end of the day, both of these claims are without theological or scientific merit. This figure shows that so-called historical science and observational science that young-earth creationist’ Ken Ham touts as unreliable vs reliable science can both point clearly to the same conclusions. The data displayed in the figure don’t reveal anything that hasn’t been common knowledge among geologists for a long time. However, this figure won’t make an appearance in your recent issue of Creation Magazine or be highlighted on the Answers in Genesis website, both young-earth apologist’ publications. Basic diagram of the crustal plates of the Earth and their general direction of motion. Plates are moving at different speeds with some moving away from each other and other running into each other. How the plates interact explains much about the origins of earthquakes and volcanoes. What does this figure tell us? It compares two independent estimates of how quickly each of the earth’s plates are moving in the Middle East. The first method of measurement (X axis – Geological slip rate) employs age of rocks determined by radiometric methods to calculate the average rate of plate motion over that time. The second method measures the rate of plate motion from GPS readings of the precise locations of each plate over time (Y axis). GPS measurements were recorded over a 10 year period allowing the rates of plate motions to be directly measured as well as an average estimated over that time period. Plates that move a few millimeters in a few years? Yes, initially this may seem a rather dull finding. But these data are remarkable for one reason: In almost all cases the estimates derived from these independent methods are in full agreement! Why is this agreement significant and how does it prove* that the earth is ancient? It is significant because it shows how predictions in science can provide powerful confirmation of a theory when those predictions are confirmed by future observations. The geological slip rates—the motion of Earth’s plates—were determined by several methods, involving multiple research teams over the past 50 years. I could spend 5000 words describing exactly how these rates were calculated, but to understand the significance of this data is makes no difference how this was done or that your understand the methods. All that matters is that you appreciates that the estimates of rates of plate motion have been determined by multiple teams of investigators over many decades. These rates were calculated using conventional—old earth—assumptions about radiometric dating. Radiometric dates obtained for rocks ranged from 1 to 20 million years were used to back-calculate rates in millimeters per year plate motion. These calculated rates of plate motion represent the speed of plates over millions of years in the past but also predicted what the present-day motion of the plates should be. It is important to note that when the plate motion calculations were made there were no instruments precise enough to measure the present-day motion of the plates. Scientists inferred from their rocks dated to millions of years old how fast the plates were moving in the past and into the present. Today, we have lasers and global positioning satellites that can track precise movements of the earth’s crust down to hundredths of millimeters per day. This has allowed geologists to directly test the rates predicted by radiometric dating of millions of years-old rocks. The key results: rates of plate motion predicted from dating ancient rocks yield the same rates as GPS measurements of real-time plate motions. It means that current plate motions are the same, or nearly the same, as plate motions from 100, 10,000 or 1 million years ago. The probability that these rate estimates, based on two independent methods of data collection, happen to be the same as a result of chance alone is so small that it makes winning the PowerBall look like a great bet. This data allows us to be as confident as one can be that tectonic plates have been slowly moving for vast periods of time. This is smoking gun evidence that the same geological processes have been occurring continually and at roughly the same speed for millions of years. How does this fit into a young earth model of the earth? It doesn’t. The evidence against the young-earth model, based on this data alone, is very compelling. Please think about this for a minute and let the significance set in. Young earth creationists (YECs) have long railed against the validity of radiometric dating. They have argued that the method is unreliable and will provide incorrect dates because of erroneous assumptions including the assumption that radioactive decay has been constant over time. But in this case, YECs can make up any excuse they want for why they don’t believe those dating methods and why the estimates of rates based on them are flawed. It doesn’t matter. In fact, the more problems they claim exist with radiometric dating methods, the worse their problem becomes. Why? Because if the dating methods and rate estimates are wrong there should be no correlation with rate estimates based on real-time GPS measurements. What young earth model would make the prediction that plate motion rates based on “bogus” million-year old dates of rocks should yield the same rates directly measured by technology that we have in our cell phones? None. In fact most young earth models include a versions of highly accelerated plate motions in the past, following by a rapid slowly of plate motion resulting in current plate motion rates only having existed for the past several thousand years. So, according to current YEC hypotheses, estimates of past plate-movement rates should not equal rates measured in the present. The correlation of GPS and radiometric dating measurements of plate motion falsify the accelerated plate tectonics model of flood geology. Radiometric/Geological estimates vs Geodetic/GPS estimates of continental plate motions. Labels indicate names of places where rates have been estimated using both methods. Figure from AlRaheji et al. 2010. Back to the figure from AlRaheji et al (2010), I want to highlight just one of the data points on this graph as an example. I have written about the Dead Sea and the origin of the Jordan Valley (The Origins of the Dead Sea Part III: The Levant – a Land Literally Ripped Apart). I mentioned there that the Dead Sea is formed by a rift fault between two plates and that the plates are presently sliding past each other at a bit over 4 mm/year. In the figure above, this is the SDSF (South Dead Sea Fault) point. The vertical bar represents the variance possible (sort of a confidence interval) of the estimates based on geological estimates (radiometric mostly). These standard deviation bars are wider than the vertical bars, which represent the possible range of error for the GPS estimates, because the latter is so much more precise. Nonetheless, what you can see is that the GPS and geological estimates overlap for all the sites included in this study, including the Dead Sea fault. If the Dead Sea fault had moved hundreds or thousands of feet in a year even just a few thousand years ago, as YECs might expect and should predict, the estimate based on present-day GPS readings should not be close to the estimate based on movements averaged over millions of years of time. But they do match and so we know beyond reasonable doubt that the Arabian plate on the east side of the Dead Sea valley has been slowly moving north for millions of years. Lets widen our view a bit. Below (fig 2) is another example of the same type of data but now we see measurements of plate motions from all over the earth. Figure 2. Rates of plate motions based on GPS and laser methods vs radiometric dating methods for all of the plates of the world. Figure modified from Robbins et al. 1993. Let’s take point A as an example of how to read this graph. Here a particular plate on Earth was estimated to be moving at about 90 mm/year in a particular direction, an estimate based on radiometric methods. Many years later, direct laser-based methods were used to measure the current rate of motion. The fact that point A falls nearly on the line means that modern-day plate movement is nearly identical to the motions estimated to have occurred for millions of years. Plates predicted to have fast motions away from each other in the past have the same rate of motion today. Plates running into each other at a particular speed, measured in negative values, are moving toward each other at the same rates today. I risk being redundant, but this point is important to emphasize. These values should NOT be the same if the worlds tectonic plates are only 4500 years old as predicted by flood geology. Why would radiometric dating, which YECs repeatedly tell us is a useless tool for estimating the true age of the earth, provide near-precise estimates of current plate motions, which are confirmed by a completely unrelated means of measurement? For the YEC hypothesis, they shouldn’t. And yet they do. The only reasonable explanation for what we see here is that the radiometric dating methods provide faithful estimates of the real ages of the rocks. The GPS data are yet another independent confirmation of the validity of radiometric dating. The fact that radiometric based dates predicted rates that were confirmed later by another method serve to confirm the former method. This is no conspiracy. Forty years ago, scientists could not have faked the radiometric dating to derive estimates of plate motions that they knew we would discover in the future with the advent of better technology. How could anyone have known that one plate should is currently moving 120 mm/year and another one only 2 mm/year? They simply calculated ages, did simple division (age divided by distance), and derived a rate. Because no one could have known the modern rate of plate motion, there was no way for any scientists to fudge numbers to manipulate dates to particular assumptions about rates, as YECs have long claimed. The plate-movement rates are unbiased, and I think we can be reasonably sure that satellite measurements are unbiased recordings of the rates as well. The fact that any of the dates, much less the majority of them, match one another is very strong confirmation of the constant motion of the plates over long periods of time. Technology similar to that found in our cell phones has pounded a rather strong nail—among the thousands already there—in the young earth creationist’s coffin. Let me provide another example to further show this is not just some cherry-picked data. Below (Fig. 3) is one additional example that I have used in one of my lectures. It shows the relationship between the distance of an Hawaiian Island or seamount from the active volcano. By dividing the age of the island as determined by radiometric dating by the distance it is possible to estimate the speed at which the pacific plate is moving toward the northwest. This was done more than 40 years ago. In the past decade we have been able to measure the current rate of motion via GPS technology and it is very close to 8.6 cm/year. This is an incredible coincidence if radiometric dating methods are unreliable or if there has been accelerated decay of radionucleotides as some YECs have claimed. Rather than a coincidence these similar estimates are a powerful testimony to the accuracy plate tectonic models and of the accuracy of radiometric dating techniques. Figure 3: Hawaiian Island movements on the Pacific plate measured by radiometric dating. Figure modified from: Clague, D. A. and G. B. Dalrymple. 1987. The Hawaiian-Emperor volcanic chain Part I: Geologic evolution. U.S. Geological Survey Professional Paper 1350:5-54. *I use the words “proof” or “prove” here in the legal sense in a court of law. This is evidence that is beyond reasonable doubt. Figure 1: ArRajehi, A., McClusky, S., Reilinger, R., Daoud, M., Alchalbi, A., Ergintav, S., … & Kogan, L. (2010). 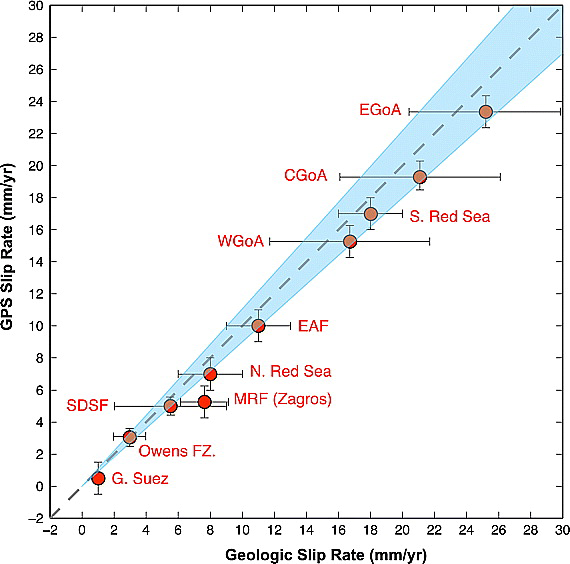 Geodetic constraints on present‐day motion of the Arabian Plate: Implications for Red Sea and Gulf of Aden rifting. Tectonics,29(3). Figure 2: Two sets of plate motion rates compared. The vertical (left) axis shows rates averaged over a few to a dozen years of increasing (positive) or decreasing (negative) distance (some continents are being pushed toward each other and thus the negative rate) on 149 lines between 20 space geodetic sites (very long baseline inferometry or satellite laser ranging). The bottom axis shows rates predicted from a global plate motion model called NUVEL-1 which averages motion over about 3 million year time periods. These modeled time estimates were determined using the ages of geomagnetic reversals from the timescale of Harland et al. 1982 A geological time scale. Cambridge University Press. Estimates of plate motion in the past are also determined by radiometric dating of island chains such as Hawaii seen in Figure 9. The line represents where data points should be if estimates of past and present motions were identical. Large deviations from that line would signify very different rates in the past and the present. Figure modified from: Robbins, J. W., D. E. Smith, and C. Ma, Horizontal crustal deformation and large scale plate motions inferred from space geodetic techniques, in Contributions of Space Geodesy to Geodynamics: Crustal Dynamics, edited by D. Smith and D. Turcotte, pp. 21-36, AGU, Washington D.C., 1993. Figure 3: Clague, D. A. and G. B. Dalrymple. 1987. The Hawaiian-Emperor volcanic chain Part I: Geologic evolution. U.S. Geological Survey Professional Paper 1350:5-54. Thanks. I have written about this as a tangent in other posts but it seemed like it deserved to be highlighted by itself. First, I should note that I’ve been following you for some time. I really appreciate your pointed, but generally respectful, probing of the Young-Earth position. I’ve been bummed by your rather frequent typos or editorial errors. (They tend to reduce the sense of academic integrity I prefer when quoting sources.) But I realize this is a blog and not an academic treatise, per se. Still, you provide an academic’s perspective that I have not found elsewhere. I am thrilled with the apparent LACK of such errors in this post! I’ll be interested to see how he replies. If you have the Jetpack plugin installed and the Spelling and Grammar feature enabled, you can go under your user profile and you should see some nifty proof-reading options you can enable. Also, great post. I ‘ll definitely be referring back to this. Thanks for the info. Unfortunately I’m not self-hosted and so it looks like that isn’t an option for me. Looking at the features has me rethinking the WordPress hosting though. Wow, they…didn’t even touch the data in that article. They just dismissed everything as relying on unreliable assumptions, and assumed readers would take their word for it. Not even an attempt to explain the convergence of evidence from their “model!” At least when scientists debunk YEC, they go through the data and explain the errors. Thanks for sharing this information! I’ve been following your blog for some time now, it’s a fantastic resource for understanding geology and Christianity (as well as refuting YEC, of course). One thing, though, I had trouble with. How were the rates of plate movement measured using radiometric methods? I understand how the Hawaiian island one works, but I’m struggling to figure out what exactly they measured for the plates. Thanks, yeah, its a bit more complicated than the Hawaii calculation. One way is by dating the magnetic reversals at ridges. The Red Sea rift which is pushing the Arabian plate to the north away from Africa has been doing so for a long time and the magnetic striped patterns of the rocks lying horizontally along that rift can be dated directly but are more likely to be dated indirectly via radiometric dating of other rocks that tell us when different reversals of the earth’s magnetic field happened. By looking at how far that reversal is from the actual ridge one can then calculate how long it has been since that reversed magnetic rock was at the ridge itself which gives a rate of motion of the plate. So it is indirect but nonetheless radiometric dating provide the underlying dates on which measurements of plate motions were determined in that past. Dan: I thought rates of plate movement were measured using Global Positioning System technology. fixed it. Yep that is exactly what happened. I type the work nucleotide all the time. Thanks again for this really wonderful post. I had been thinking of trying to type up a summary like this on my own blog but I was pretty sure I wouldn’t be able to do the evidence justice. Now I can direct people here instead. This is one of your best posts, in my opinion, and it really presents shocking evidence against a YEC paradigm. I remember running into this evidence at the debate at ETS a few years ago and I was just totally blown away. It is simply incredible to deny this evidence. Are you implying here that they do not all match up? If so for a fuller understanding and disclosure would you relate one that doesn’t and how you explain it not matching? Not all the current rates of motion measured by GPS match rates estimated by radiomentric dates spanning 10s of millions of year or more plate tectonics would predict that they will not all match. 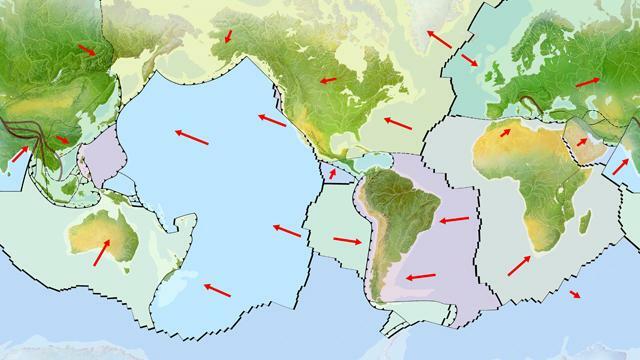 The reason is that as plate move continents run into each other. When this happens, such as when India ran into Asia, the plates will be slowed down. When one plate slows that can effect the other plates around them. Some plates as they bump into each other and hit new resistance can even change their rate of motion. Also, new rifts can form that start pushing two plates apart that were once just one place (this is what happened to form the Red Sea. So when this plate motion changed 5 million or 10 million or 40 million years ago the radiometric estimates of plate motions will not match the rates of motion that are occurring today. Plate tectonic theory based on radiometric methods has developed a model of how all the plates have moved for many millions of years and thus it predicts which plates will have changed their motions over time. Current motion measurement even support this model by revealing different rates for plates expected to have different rates. This was a bit much for me to include in the article but it lends even more support for plates having moved to their current positions over millions of years. There is also a second reason why some rates don’t match and that is that we may not have accurate radiometric dating for some plates in the world. Fro some dates the confidence in the rates is not that great and so one would not be surprised to find the rates differing in those cases. Then the evidence is not quite as conclusive as you indicated and there IS a certain amount of cherry picking and rationalization of the outliers NH. There is also indication that certain other factors may speed up or slow down movement of tectonic plates such as the higher water content than expected recently discovered. Thats a new proposition and I’d be interested to see that explored as to particular geographic areas as well. In addition given the exceptionally small sample size of ten years (to extrapolate millions) you cannot even conclude that over a 50 or hundred year span the numbers would not in fact be even more substantially off. Finally of course some plates would be predicted to be moving faster than others because the calculation of speed is not merely based on radiometric dating but the distance presumed to be covered. its not as if the date alone determines the presumed speed. a 10 year sampling of GPS data that seems to have not even at that totally validated All previous radiological calculations is somewhat absurd to claim as conclusive don’t you think? Lets presume that generally, as considered before most recent research, the plates are generally slowing down and let us presume for a moment that the rate of speed was higher in the past as YEC claim. it stands to reason that at some point regardless of their speed not being constant (Again presuming ) the slowing plates would intersect with the prediction of the radiometric based calculations before even falling below the predictions. falling speeds by necessity will intersec at some point and time (how long is another question) with slow speeds. In that case the correlations would merely be temporary and not conclusive at all due to the slowing rate intersecting with the presumption of the radiometric dating. To me saying you have ten years of GPs data just is not good enough for the certainty you are declaring. Even in a YEC framework thats a vanishingly small sampling and the fact that it doesn’t by your own admission correlate across the board of all previous estimates makes that even more dubious to claim certainty. 10 years is fine. In fact a 6 month sample would make the point I made very effectively. If the rates varied much over the past 2 million years than a 10 year estimate should have no hope of coming anywhere close to the same values. The fact that most do cannot be ignored. The outliers are the issue, the issue is that even some of the data points match. That is powerful evidence. The analogy would be, if you found that 99 of 100 times you found a specific viral strain in people with a particular form of paralysis if would be unwise to dismiss the correlation just because one person with similar paralysis doesn’t test positive for the same virus. It would be perfectly legitimate to look for a reason why the 1 person acts differently. The correlation must be explored and explained rather than the outliers being used to dismiss the data that correlate. In 6 months one can get a reasonable estimate of plate motion in the present. That matches the vast majority of estimates of motion over the past million years. That data cannot be ignored even if there are data that don’t fit the pattern. and it isn’t even credibly over a long stretch of millions of years that such events would not take place in ANY part of the world throwing off a claim of constant rate movement. of course they would since a declining higher speed will intersect at some point with ANY slower speed projection be it right or wrong. You are pretending that a slow down in a previous higher speed would never and could never intersect but they would by necessity. I haven’t read much YEC material on this (close to none) but I hardly think they claim that speeds did not decline even to zero relative to the forces they proport caused higher rates of drift. The only question would be of when and for how long a slowing rate would intersect with any other projection of movement (be it radiometric derived or otherwise). You may still have a point based on various details of particular plates but that makes the outliers of importance to analyze rather than dismiss out of hand as you are trying to do. unfortunately, for your point, we are not merely talking about patterns but dating systems/speed measurements. if they fail under some circumstances it is absolutely ridiculous to claim – well just throws those out and ask no more questions . To use a more fitting analogy your argument is that if a ruler measurement works more times than it is fails (in a limited time test no less) we should have confidence in its measuring ability and forget about when it is fails. Thats illogical and even worse so when your sample for the test is too small for the job you are trying to make it do. I’m not saying it doesn’t and can’t deviate over thousands of years. What I am saying is that most measurement made over 6 months are statistically the same as those estimated over a million years. Those are the facts and that is what begs the question why if there plates are not moving at some relatiavely similar rate over time. Rapid plate tectonics as envisioned by Baumgardner would predict that no rate estimated over 10 years or 6 months would give a rate close to that estimated over long distances of movement and yet they do. This is very strong evidence that the plates have been moving just centimeters per year over millions of years. Plates may change speed over thousands of years but those changes are tiny compared to the time involved. The article you reference is evidence for my point. The Indian plate may have sped up by 1 cm/year over a 10 million year span. I don’t know how fast it is moving off the top of my head but lets say it is 15cm/year then it was 14 cm/year 10 million years ago. My chart compared GPS speed with classic estimates over the last 1 to 2 million years. At that time the plates may have been going 14.8cm/year so the difference between GPS and radiometric dates would only be 0.2cm/year or 2mm year which is hardly a significant departure. To get that similar of numbers with two completely different methods of analysis is really amazing and begs the question why in a YEC model would these values be similar at all if the plates all moved fast during the flood? Just looking at your Indian plate motion article again. Not sure how that helps a YEC at all. Absolutely plates are effected by erosion which is caused by weather. Nothing surprising there. As land is eroded the plate thins which should speed it up a bit. But the rate of speed increase is on the scale of a millimeter per 100,000 years which is pretty quick with respect to a billion year old earth but not nearly fast enough for a YEC model that requires massive changes in speed. If plates really changed that fast in the recent past there would be enormous destruction in the post-flood world. The Dead Sea valley would be ripping apart at such a rate that no peoples could possibly have settled there with the earthquakes and volcanic activity. And yet the Bible records people there well before Abraham ever arrived. Makes more sense that the Dead Sea valley slowly formed and the earthquakes were spaced out such that civilization could exist. lets say I claim a group of runners are fast runners and can top ten miles a hour at top speed. You say they can’t or haven’t. You’ve calculated their age based on your dating technique and based on your dating of them which lets say I am not buying you say they’ve kept a constant speed and walked their way to where they are. My contention is they ran top speed and slowed down and your age system is bogus. You are looking to verify your age claim of them based on their speed. so you take a two second snap shot of them and quite a few of them fit your slow speed. remarkable? Not at all. You see my runners are getting tired and weaker and slowing down more and more the longer they go. At some point its not even possible for them not to slow down to the speed you want (and afterwards even slower). So its all a matter of when you measure their speed. The match itself is unremarkable. Worse even in your two second snapshot quite a few of them didn’t match your age based speeds at all. Those are facts too and waving your hand to avoid facts just doesn’t work. ND you are getting kind of lost in your own suppositions (the third problem I alluded to earlier). The strength of your argument in this post is tied to the alleged remarkableness of the correlation. Since its a certainty that ANY slower rate prediction would intersect with slowing tectonic plate movement its not remarkable and so doesn’t stand as proof of an old earth (not yet as you have presented it without addressing the sample size and the outliers that show problems). That being the case at least as far as this post is concerned no YEC has to adhere to ten million year time spans. The increase was 1cm per year and it was sustained certainly for more than ten years which you claim if you remember was a good sample. At any rate you are assuming an acceptance of the age so your left assuming your premise which is circular. I should say at this point that I am not a confirmed YEC though for the moment I lean that way. I just like sound arguments without the rhetoric of claiming you’ve put the nails in the coffin of what other believers hold to – at least until you really do at least. Actually it hurts your claim since the speeding up of the indian plate takes place within the time period you projected and shows no such consistent movement. it shows a mechanism that has NOT been a part of the calculations prior to 2011, has no reason to be limited to the Indian plate and adds more issues to the dubious idea that we can project steady rates across millions of years based on looking at a few years GPS co-ordinates. please please can we skirt past that standard rhetorical device used so often on the net. This IS new stuff we learned in the last few years not some ho hum we knew this. We ARE still learning about Tectonic plate movement which at least to me adds to it being dubious to make all kinds of dogmatic statements about it. I don’t recall getting into flood or flood geology here. Maybe I did?. I was more discussing this alleged smoking gun. if you want to change that argument into the smoking gun I suppose I could look into it but i m going to bet that issue has been addressed by those who are YECs. Seems likely it would be. I must say theologically I don’t buy that if God wanted to separate the continent he would have had to done it in away that left the land inhabitable but then again I don’t know that pangea breaking up could only be a flood event biblically either. The Dead Sea reference was because this smoking gun evening was in the context of my series on the Dead Sea. Not sure how you can think that 1 cm change over 10 million years isn’t a small amount of change. http://www.sciencedirect.com/science/article/pii/S0012821X11000975. As I said, the smoking gun is estiamte of rates over 1-2 million years compared to the past 10 years not 10 to 20 million years compared to the past 10 years. Of course plates have changed their speeds over much longer periods but most plates have maintained nearly constant rates over the past 1 million years. No one would expect a plate to be the same 100 million years ago compared to today but plate tectonics in an old earth context would predict that most plates have not Significantly changed their motion on a much shorter (1-2 million) time scale. This is what is what is found. However, you cans see from the Hawaii example at the bottom that some plates haven’t changed their speed in 20 million years. Look at the slope of that line. I don’t know how to explain why anyone could take a radiometric age of an Island 800 miles from the tip of the Island chain and divide that age by the distance and get the same value as read by a GPS unit over 10 years? That correlation can’t be explained by your runners and any of your other analogies. I haven’t proven anything, there are always other alternatives, but clearly these data do not point to a young earth. They don’t suggest the earth is young in any way. The only way you can get to a young earth is to simply believe that it cant’ be true and to force an alternative hypothesis. NH like I said you are getting lost in your own assumptions 1 cm over 10 million years would be a small change (although at the time an increase of 1cm would not be small to throw off your claim that a ten year sample is good enough) BUY YECs DO NOT ACCEPT that time scale. You seem to forget that your speed correlation is what is supposed to back that up in your piece but sine there would be some correlation at some time due to slowing speeds even in the YEC model , you have several anomalies where your “clock” fails and your sampling rate is thin as paper you have not yet made that case. circular . You cannot assume your premise to get to your conclusion. Like I have said before you are extrapolating that alleged fact out based on a small sample , you are refusing to see that the rate can (AND MUST at some point ) coincide with your radiometric based speed calculations for other reasons that may leave them outside the range later, AND because you are arguing that anywhere the measurements fail to correlate they can just be flippantly hand waved off. Of course it can be. You just don;t want to see it because it suits you not to or are getting lost in your own assumptions again. If a YEC holds that its actually been twenty thousand years but the speed has been decreasing dramatically at first then slowly over time (their time model) then at some point for quite some stretch of time it will be moving at various slowing speed say of 10 cm, 9 cm 8cm right down possible to .5 mm over the last say three thousand years. rather than your premise that the rate would never intersect it would be inevitable they would Your argument is akin to saying a helium balloon hovering an inch from the ground proves they don’t float higher. Well guess what? hang around long enough and you MUST get that proof because the Baloon eventually will hover at that distant as it loses helium – only problem is you’d be wrong even with that “proof” . At some point the rate of speed would be what you are seeing even the YEC model. Again the only questions is when and for how long. Where your argument can still work is as you compare it to all the other plate movements but then you can’t just willy nilly claim the outliers don’t matter to make that argument. In each case where you system fails to predict the speed theres a reason it doesn’t . You’ve offered a potpourri of explanations why they don’t but those need not be accepted at presentation but examined for validity. Thats all I am calling for. and now comes the usual rhetoric that so poisons the well in all these discourse of YEC “believers” with OE “believers” that I so detest and dishonor Christ. The inevitable slanderous suggestion, innuendo or sometimes direct accusation of wishing to hide facts and be intellectually dishonest. Over some matter of doctrine critical to the faith? Nope. just based on a disagreement over the age of the earth. Reading both sides sometimes I get the impression they believe there will be an OE patch of heaven and a YEC area. Perhaps separate floors in the New Jerusalem? Where have I forced anything? Any body slowing down to zero movement will intersect with all decreasing speeds. I’ve merely pointed out that FACT. How did I force that there are GPS movements that do not validate the radiometric derived speeds? I asked the question and you admitted there were and really thinking that using a sample size of ten to extrapolate out to a million might prove error prone is forcing? Your blog your ball game but you accusation is ridiculous. What I find you being particularly obtuse about is sampling problems and if you give the paper connected to your first graph a better read you will see that the authors do in fact hold out hope the largest outlier ( I believe Iran) will fall more into line with more and better measurement. In other words they unlike you allow for rates to change with better and further measurements in order to bring non correlating speeds in line (but can just as well work the opposite) The whole 6 months thing was just quite a bit of bluster. With respect to Aileen Pey’s posts, plate deceleration is contradicted by radiometric dates from the ocean floor. If it all took place over 4,000 years time the ocean floor would have a relatively constant radiometric age. If it is asserted that the radioactive decay rates were faster they would still show deceleration of plate movements. Kellerobert: Please provide me these radiometric dates of the ocean floor that you are asserting the existence of without any reservation. Please provide multiple radiometric dating methods confirming one another and give all assumptions that are employed in the use of each dating method. Thank you. I have confidence that you will come through for me, since you are so certain that undisputable dates from the ocean floor exist. I can’t wait to see the volumes of data you provide! What a mind numbingly dishonest pile of garbage. Wow! Where should I start with this hogwash. That is a factually incorrect statement. Stating this doesn’t make it true. What is the margin of error? Why is the margin of error not mentioned here? Where is the observable evidence to back up this statement? This is actually a laughably asinine claim. Without this claim being confirmed, this entire blog post is useless. This statement is correct. No young Earth creationists make any claim that any plate motion rates based on million-year old dates of rocks should yield the same rates directly measured by technology that we have in our cell phones. We make no such claim. Why? Two reasons. No such technology for measuring plate motions accurately resides in a single cell phone on planet Earth. Second, there is no such thing as a million-year old date of a rock that predicted a plate motion rate. None. So this statement attempted to set up a strawman, but failed. The graph included in this blog diatribe proves nothing. It’s red dots plotted along a line. No data has been provided to confirm what these dots even represent. Show me a conclusively dated ancient rock that has been confirmed to show the rate of plate motion. Show me the rocks. Show me the data. The “author” of this junk states, ” Young earth creationists (YECs) have long railed against the validity of radiometric dating. They have argued that the method is unreliable and will provide incorrect dates because of erroneous assumptions including the assumption that radioactive decay has been constant over time. “It doesn’t matter?” Really? Really, the burden of proof is on the Creationist to show that radiometric decay isn’t always constant? Sorry, that isn’t how science works. If you are making a claim that radiometric dating is constant and always has been, then you have the burden of proof to show that. Actually show it. Observational evidence. Not only that, we already do know that radiometric decay is not constant. Many variables affect it. Radiometric decay isn’t even your only variable. You also assume to know the original parent and daughter rates. We know your assumptions to be wrong in every case where radiometric dating has been used to test rock of known age. You have many more assumptions and variables with radiometric dating. It is dishonest to write such affirmative claims as this “author” is writing without putting forth all of the assumptions and claims for each of the dating methods used. Yet this “author” doesn’t even name the dating methods used. I really love the last sentence claiming that the more problems there are with radiometric dating methods the worse Young Earth Creationists’ problems become, because there should be no correlation with rate estimates…” There is no correlation! There isn’t even correlation between any two radiometric dating methods for rock, let along with GPS plate tectonic data. None. This is purely a case of making a statement that isn’t so. Nothing in this entire blog post even attempts to match radiometric dating results which confirm tectonic plate motion rates with GPS rates. It’s not here. This blog post sure does use the word “estimate” a lot for something that is supposed to be drawing a conclusion. I estimate that the “author” of this tripe can’t produce a single rock that has been dated by any radiometric dating method, provide me with the assumptions and error rates with the dating method, then show me 2 more radiometric dating methods have been used to confirm that age. I estimate that in failing to produce such a rock, the “author” of this trash will not be able to show me, using the scientific method, any method by which to conclude that this dated rock shows any plate tectonic motion rate at all. It’s really easy to claim that two dating methods have matching results when one dating method is completely fake and the other is made up and when both get to rely on any assumptions you can pull out of your hat. I think the funniest thing to conclude from this blog post is that this author actually believes that if rocks could be dated that the rocks could actually determine past rates of motion. Figure 2 is entirely make believe. If you can’t show how you determined a rate of motion from a fictional date on a rock, then I don’t accept the rate of motion conclusion. I get to throw that out make believe data. This “author” uses the word “science in his blog post 20 times, yet never once showed any data that was obtained using the scientific method. This is the problem with Big Bang Evolutionism Parishioners. They think that waving around the word science grants them ownership of science. Christians gave us almost every scientific field and major discovery there is. Since atheists started flooding the scientific community about a century ago, science has stagnated. The scientific method has been replaced with make believe, mathematics, and computer models. Atheists have contributed nothing to science. Don’t confuse science with technology. Your cell phone, which cannot measure plate tectonic movement as this “author” claims, is using the science of Tesla, Faraday, Einstein, and Newton. Not 20th century science. Radiometric dating isn’t science at all. This is why atheists rely on it. Science is an atheist’s worst nightmare. Well,that’s a lot of issues you bring up but the majority are just flat out wrong. Right off the bat you ask about margin of error but the first figure has error bars and you can look up the reference and read all about it. Just words after that and as you point out just stating stuff doesn’t make it true. Really? Can you please show me “cross checking assumptions which are independent of each other” in the scientific method? Thank you in advance.